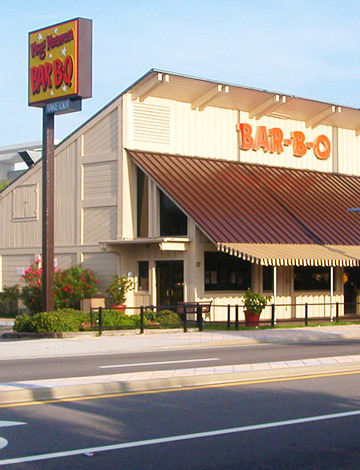 Located on the corner of Atlantic Avenue by the Ocean Center and across from the Daytona Hilton, Hog Heaven BBQ has been a local favorite for over 30 years. Because we are locally owned and operated, we cook our BBQ fresh every day. If you’ve been on the beach here, you’ve probably enjoyed the aroma of our signature smoked brisket, pulled pork and chicken, cooking “low and slow” by the same Pitmaster since 1987. Over the years, the area around us has changed a lot, but we’ve kept our BBQ heavenly and rooted in southern hospitality and charm. Come inside and cool off, or take a seat on our patio and enjoy the sights and sounds of Daytona’s beachfront area. For those who can’t decide, try a combo! A Delicious Combo sure to Please! Due to our natural smoking process, meat has a tendency to be pink. Mom gives ‘em Thumbs Up! We’re conveniently located near the Peabody Auditorium and the Ocean Center in Daytona Beach. So, what are you waiting for? They’re waiting for you at Hog Heaven!